On March 20, 2009 producers from CNN’s Anderson Cooper 360 contacted Davis Law Group founder Chris Davis to ask his opinion on the circumstances surrounding the death of movie and Broadway actress Natasha Richardson. Richardson died on March 18th after a traumatic brain injury during a skiing accident at a Canadian ski resort. 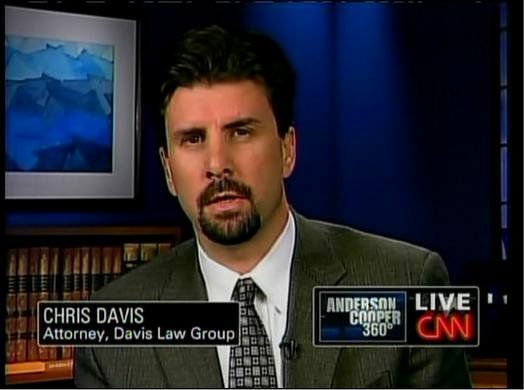 Chris Davis appeared on CNN's Anderson Cooper 360 to discuss the legal considerations surrounding the death of actress Natasha Richardson. ANDERSON COOPER: Tonight new developments in the tragic death of Natasha Richardson. A wake was held for Richardson today in Manhattan at the American Irish Historical Society. Richardson’s husband, Liam Neeson, who attended an emotional vigil on Broadway last night, was joined by Richardson’s mother, Vanessa Redgrave, and sister Jolie Richardson along with other family members and close friends. A private funeral service will be this weekend. Richardson died on Wednesday after blunt trauma to the head after falling on a beginner ski slope in Canada. Now the resort where the incident happened said that the 45 year old actress was taken to a local hospital about an hour after the accident. But today the ambulance service that was called to the resort disputes that timeline. Saying that Richardson did not arrive at the hospital until nearly 4 hours after she fell. That is a nearly 3 hour difference from what the resort originally said. Joining us tonight chief medical correspondent Dr. Sanjay Gupta who is a neurosurgeon. And attorney Chris Davis who specializes in medical malpractice and personal injury. Sanjay, now that we have this full timeline of events directly after Natasha Richardson’s fall would you say that timing played a role in her death? SANJAY GUPTA: Yea, ya know, absolutely Anderson. When it comes to these types of injuries where there is blood accumulating underneath the skull you have to try to operate on these as quickly as possible. It is tough to give an exact timeline. But if you take a look at an image like this…pay attention to that red spot, that red accumulation of blood starting to form and it has nowhere to go Anderson but push down on the brain. The operation to remove something like this is relatively simple as far a neurosurgical procedures go. But timing is key if I can just show you really quick Anderson on a model like this…if you are looking at a skull model here…ah you basically just have to try and remove some of the bone and take that pressure off the brain. And put the bone back after the blood is removed. That is what you have to do. It is a pretty short operation but you have got to do it quickly. ANDERSON COOPER: Chris, could the ski resort be liable in her death? ANDERSON COOPER: The ambulance says that they basically saw her from a distance. But that she had declined to be treated by them. CHRIS DAVIS: Yea, and that raises a serious question because certainly in our jurisdiction when an emergency crew arrives on a scene they have a duty to at least make contact with the person who has been injured. Check that person out, ask the person questions, especially in cases of head injury when often times the person’s judgment is the first thing that may go. ANDERSON COOPER: Sanjay, if someone that has fallen though and it takes two or three hours for them to really starts feeling effects would and EMT crew be able to determine something by just casually interacting with somebody? SANJAY GUPTA: Well keep in mind the amount of force that caused this amount of bleeding on the brain was probably significant force. She developed what is called and epidural hematoma which is that blood collection that we showed. If somebody had watched that fall Anderson they probably would have noticed her take a pretty hard hit to the ground. Also almost without question she probably had some disturbance of her overall consciousness. While she may not have lost consciousness she may have been confused she may have been pretty simple tasks like counting backwards from 20. Being able to know exactly where she was, what day it was. Just sort of simple things that you check for in the field. So ah, you know, there were probably clues even early on, Anderson. ANDERSON COOPER: Chris, at this point what else, as an attorney, would you look at? CHRIS DAVIS: Well, I would certainly look at the situation. I look at a case and I say, “okay, what was done, how could the incident have been prevented?” Either what was done or not done that contributed to this horrific event. And I certainly would look at the resort and their policies and procedures. Did they have those in place, were they followed in this situation when somebody is being taken off the hill after an injury. ANDERSON COOPER: Does it also raise questions to you that the resort came out very quickly and said…they were the initial source for a lot of the information that was out there days ago. And they said were the ones who were saying, look it was an hour and she was walking around and laughing. And now according to this ambulance. It was actually four hours? CHRIS DAVIS: Yes, that is very questionable and suspicious. And like Dr. Gupta said, I find it hard to believe given the there is a death here that she did not exhibit some clear head injury symptoms soon after the initial trauma. Like feeling dazed and disoriented….the feeling that she is not herself. ANDERSON COOPER: Sanjay what you said earlier is important I think so a lot of people don’t freak out every time they fall. It’s got to be a pretty significant fall. And what should somebody look for in the immediate aftermath of a fall to see if they may be having a problem? SANJAY GUPTA: Yea, that is a really good point. What happened here is a very rare occurrence. And it was touted as this sort of innocuous experience. But it was probably a pretty severe blow. If someone looses consciousness that is obviously a sign that something more is going on. Or if their consciousness has been disturbed in some way they just seem sort of out of it they get a really bad headache if they and weakness or numbness on one side of the body. Those are all signs. These can all be vague. But it is important to know that even with even with something that seemed like it was not that big a deal as far as a fall goes…if it looked bad…if she had some sort of disturbance of consciousness to get checked out and checked out as quickly as possible. ANDERSON COOPER: Chris Davis I want to thank you for coming on. And Sanjay welcome back….